Latvian folk and pagan metal band Skyforger has signed a record deal with California-based Metal Blade Records. Metal Blade Records, founded in 1982 in Los Angeles, is one of the best known and most influential record labels worldwide that deals with metal music. Throughout the years, the company has worked with artists such as Metallica, Slayer, King Diamond and As I Lay Dying, among many other well known metal bands. Skyforger’s forthcoming album Kurbads will be released on Metal Blade Records on April 23 in Germany, Austria, Switzerland and Italy; April 26 in the rest of Europe; and on May 11 in North America. Kurbads will be a concept album about Latvian folk hero Kurbads, who was born magically from the white mare and did many great deeds. Skyforger will also be on tour in Europe this spring and summer, including performances at a number of European metal festivals. 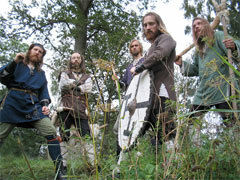 For further information on the band, visit www.skyforger.com. Latvian pagan metal band Skyforger has signed with Metal Blade Records and will release its next album in April. Skyforger will be rocking the rafters of the Latvian Opera House on Feb 23 at the recording industry’s annual awards. They will be joined onstage by fellow warriors, Auli. Hard hats will be issued to the audience; seat belts are optional.